If you use a Mac, you work with text. Your documents may be short (tweets and iMessages) or long (reports, stories, or even novels), but you need an app to handle that text. Depending on the type of writing you do, you may want something as simple as a basic text editor or as complex as a full-featured word processor; if you write code, you want an editor designed for that type of content. I tend to use what have come to be known as focused-writing apps. These apps, increasingly popular of late, allow you to write in a focused environment, export your writings to various formats, possibly apply basic styling, and let you print your work. Unlike a word processor, which has lots of complex features for formatting and styling text, or a text editor, which is better for complex text modifications or working with specific code languages, a focused-writing app takes a minimalist approach, providing just the necessary text tools for writing and then getting out of your way so you can focus on your words. What makes a good focused-writing app? A distraction-free environment—or at least a special view or mode—that allows you to focus on your writing without worrying about toolbars, palettes and other formatting tools. A full-screen mode, so you can shut out everything else on your Mac’s screen. Support for the Markdown writing language, a simple syntax for formatting plain-text documents that can be easily converted to HTML for use on blogs or web pages. Document statistics. Data such as word count and character count are essential to many writers; some people may also want more-advanced statistics such as reading level and estimated reading time. iA Writer is a minimal, yet powerful writing app. 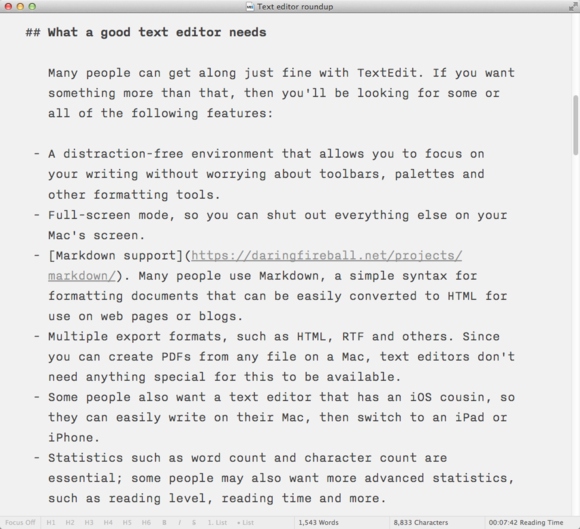 iA Writer’s Markdown support is very good. The app offers a formatting bar at the bottom of the window that lets you quickly apply Markdown formatting, even if you don’t remember which syntax characters to use. You also get a decent Markdown-preview window, though it’s not customizable. In fact, that’s one of iA Writer’s hallmarks, love it or hate it: Little in the app is customizable. If you don’t like what’s here, you should look elsewhere. But if you like iA Writer’s approach and attractive styling, you’ll find it to be a great tool to write without distractions. There are also iOS version of iA Writer, for iPad and iPhone, and those apps work with iCloud, but you can also use Dropbox to be able to access your files from any app. Hog Bay Software’s $10 WriteRoom is a bit like iA Writer with more options. WriteRoom comes with a handful of default themes, and you can download others or even roll your own, if you’re so inclined. You can zoom your text and use any font installed on your Mac, and the app’s Typewriter Mode automatically scrolls your document as you type, similar to how you’d see a piece of paper move in a typewriter. WriteRoom has no Markdown (or other language) preview, however, limiting its usefulness for writing in anything but plain text without an additional app to show what your writing will look like. WriteRoom lets you choose different themes to suit your preferences. Metaclassy’s $10 Byword falls, feature-wise, somewhere between iA Writer and WriteRoom—it lets you choose between a dark them and a light theme, and it lets you choose your font. But Byword gets Focus Mode right, allowing you to choose either Line Focus or Paragraph Focus. It’s also got a typewriter mode, it supports rich text, and the premium version (unlocked via a $5 in-app purchase) lets you publish your writings directly to WordPress, Tumblr, Blogger, Scriptogr.am and Evernote. Byword is also available in iPad and iPhone versions, and it syncs your files using iCloud. However, fans of Markdown will want to steer clear (unless they use Marked, below), as Byword’s Markdown preview requires that you toggle between edit and preview mode—you can’t proofread using the preview and make changes to your text at the same time. I like Byword’s paragraph focus, which highlights the paragraph I’m working on while dimming the rest of the document. Hog Bay Software offers an alternative to WriteRoom called FoldingText, which, while not exactly a focused-writing app, does something interesting. The $25 app is a combination of a text editor and an outliner: You format your text with Markdown syntax, but you can “fold,” or hide, sections by clicking on header characters. This feature lets you write longer documents, keeping a big-picture view without having to tediously scroll up and down. You can also move sections around like an outliner, but FoldingText is still, at heart, an app for writing and working with text. When you’ve finished writing, you can export your document to HTML, or copy it to the clipboard as HTML or rich text. 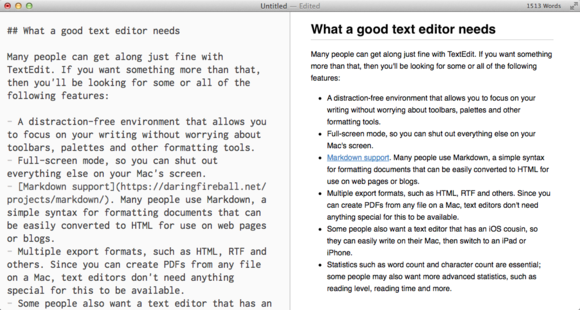 FoldingText lets you collapse your document sections, move them around, and reorganize them. TextEdit Many people can get along just fine with OS X’s built-in TextEdit, which is actually a full-blown word processor. It can handle serious formatting, such as lists and tables; can work with graphics, videos, and audio files; and can export to a variety of formats, including RTF and Word. 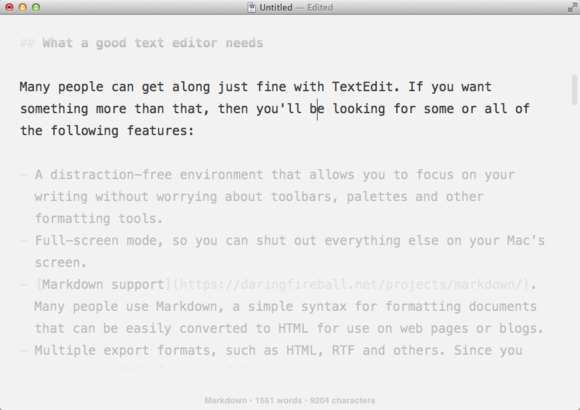 But despite its many formatting options, TextEdit is a “plain text” editor at heart—it’s the direct descendant of Apple’s aptly-named SimpleText, and the much older TeachText, both simple tools designed for editing and displaying text documents. It also offers no true distraction-free mode, doesn’t include full-screen mode, and doesn’t explicitly support Markdown formatting, though if you use it in conjunction with Marked 2 (see below), you can write in Markdown and preview your formatted documents. Mou Chen Luo’s Mou is a free (donation requested), Markdown-focused text editor that includes a live preview in a two-pane window: editor on the left, preview on the right. The app includes keyboard shortcuts for Markdown-syntax formatting, and notably offers very good support for CJK (Chinese, Japanese, Korean) languages. It’s also very flexible, letting you choose themes—including those you create—for both the composer and preview panes. Mou even lets you post directly to Tumblr and Scriptogr.am, though not to WordPress or Blogger. However, placing the editor and preview pane in a single window takes up a lot of space, and if you’ve got a dual-display setup, you can’t separate those views so that the editor resides on one display and the preview on the other. You can temporarily hide the preview pane, but the window doesn’t resize, instead expanding the editor pane to twice its width, which can be annoying. Also, you can’t choose which side of the editor the preview pane appears on—I prefer to have my preview to the left of my editor, and I can’t do that with Mou. Mou gives you two panes, the text editor and a preview, in the same window. While all of my recommended focused-writing apps handle Markdown syntax to some extent, few shine when it comes to previewing the formatted output (HTML or RTF, for example) of a Markdown document. iA Writer’s preview isn’t customizable; Byword requires you to toggle between composing and previewing; and WriteRoom has no Markdown preview at all. I’ve adopted Brett Terpstra’s $12 Marked (currently at version 2), which not only provides Markdown previews that are automatically updated to reflect changes you make to your documents, but also lets you customize its display with CSS files that, for example, match your blog or website’s design. Marked also includes a full range of text-statistic tools, as well as export options—so even if your favorite writing app doesn’t export to your preferred format, it’s likely that you can get such functionality from Marked. 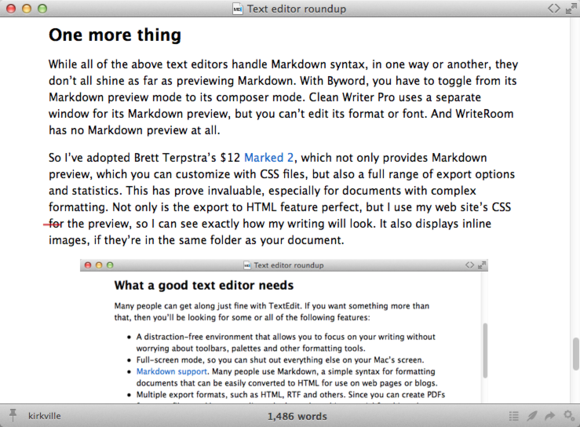 In my writing, Marked has proven invaluable, especially for documents with complex formatting—not only is its export-to-HTML feature perfect, but I use my website’s own CSS file for Marked’s preview, so I can see exactly how my writing will look. Marked can also display inline images based on Markdown and HTML links, something the writing apps above can’t do. 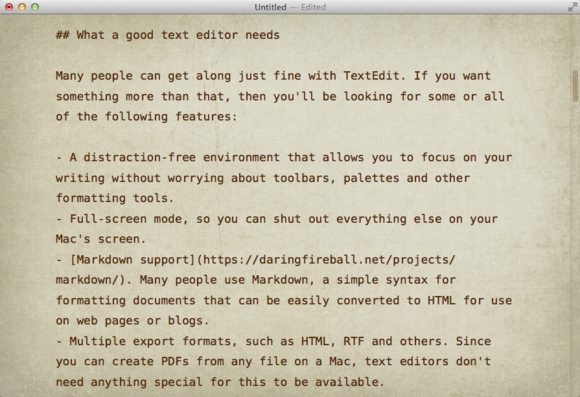 I couldn’t work without Marked 2 to preview my text documents and export them to HTML. There’s no shortage of writing apps for OS X, for any type of work, and for any budget. You may want to stick with the free TextEdit, or, if you use Markdown, look for a tool that displays formatted texts better. 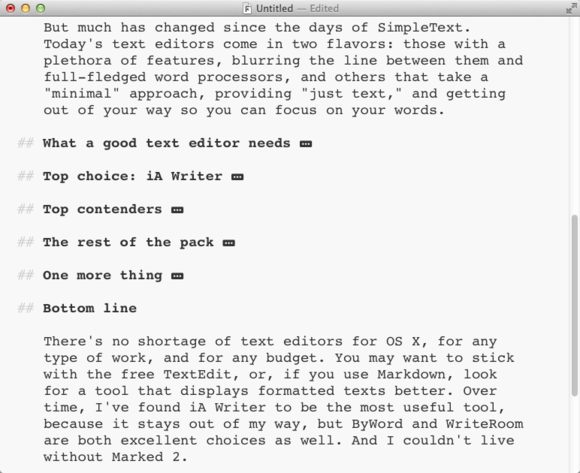 My ideal text editor would have the simplicity of iA Writer, some of the features of ByWord and WriteRoom, and the preview and export features of Marked 2. Sadly, such a dream app doesn’t exist. In its absence, I’ve found iA Writer to be the most useful tool, because it stays out of my way.